I Prevail exploded out of nowhere a few years ago with a blistering cover of Taylor Swift’s “Blank Space,” but they also set out to prove that they’re much more than just a Tswifty cover band. When they released their debut record- Lifelines they did exactly that and there was no looking back. Songs like “Stuck in Your Head,” “Outcasts” and “Come and Get It” showed their catchiness and aggression while the title track showcased their versatility and how easily they’re able to slow itdown. Enter 2019 and their sophomore record- Trauma has taken what they did on Lifelines and completely reinvented it and evolved themselves. Lead single “Bow Down” kicks things off and is the heaviest track the band has ever put together and sees them tell the listener that this isn’t the I Prevail they’ve gotten to know. “Bow Down” is the perfect way to introduce Trauma to the world and it’s a song that defines the band in so many ways. The intensity is off the charts and it’s a beautiful thing. 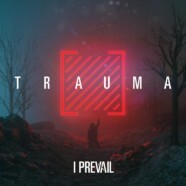 This is a track that shows so many levels and areas of I Prevail that haven’t been seen by anyone yet, including a duet between Delaney Jane and singer Brian Burkheiser that’s a perfect progression and maturation for the band. This is I Prevail’s strongest and stand-out song yet and it’s gonna be hard for them to surpass how amazing this one is. “Rise Above It” has a soft, taunting vibe that shows during the song’s verses and incorporates some rap vocals from Jusitin Stone throughout the song before Burkheiser comes in on teh bridge and chorus. They lyrics on this one are just great. “Breaking Down” is a very personal song that shows the band getting dark and taking things in another direction, letting you into a place not many can or will go while “DOA” has some electronics that work perfectly with the rap vocals; it’s a catch song that will get stuck in your head and goes back down the road “Bow Down” took us on- intense, bludgeoning and aggresive. “Gasoline” keeps the intensity going before “Hurricane” slows it down again with a gorgeous ballad that grabs and maintains your attention while “Let Me Be Sad” and “Low” are honest and say what so many people really feel on the inside but are afraid to talk about. Closing things out is “Deadweight,” which takes it up a notch one last time before “I Don’t Belong Here” finishes the record on a soft and somber yet powerful way. This album is a huge progression and maturation from Lifelines. Their debut put them on the map and really set the bar high for a sophomore album but Trauma delivers on every level. This record shows the band delving deep into their souls and wearing their hearts on their sleeves. Eric Vanlerberghe’s screams are more destructive than ever and Burkheiser’s clean vocals are so onoint, it will bring a tear to your eye. It’s very clear the band members went through some tough stuff personally between album releases and they aren’t afraid to put it into their music. They not only show that depression is normal and okay, they prove that it’s okay to talk about it and it’s okay to not be okay. More importantly, they show that you can come out of whatever hole you’re in and get back to normal. That’s what makes this album so good and in a time where depression and suicide are running rampant- especially in the rock world- this is the record the world needs right now.